A month prior, Sora was approached by Reiji to serve as a member of a dueling squad he is assembling to hunt down the rogue Duelist with as "Phantom". But in truth, his memories altered, Sora was actually sent by Eve to keep tabs on Reiji as a sleeper agent. 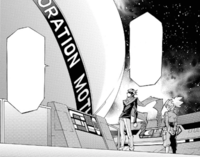 Once the Leo Corporation staff detected Phantom after he hacked into their systems, designated #3, Sora with deployed with Shingo Sawatari, and Shun Kurosaki in helicopters to surround him all sides. While given the task to catch Phantom if he should escape by air, Sora questioned Reiji's reason of sending so many people after a mere hacker. After their quarry escaped, learning the Phantom's real name as Yuya Sakaki, Sora became more suspicious of Reiji when he learned that Yuya used his time hacking into Leo Corp's Solid Vision system to help people. Reiji explaining to Sora of the danger Yuya poses. Evenually, Sora's curiosity gets the best of him as decides to access the supercomputer in Leo Corp after reach a dead end. Sora formulates a means by using special gloves and glasses with Reiji's DNA to enter the room, marveling at the computer's size while learning that Reiji allowed him to enter. After Reiji agrees to sake Sora's curiosity, the boy begins by asking who Yuya is and Reiji's reasons of pursing Yuya. Reiji explains to Sora, explaining it to be the computer's analysis, that Yuya is a threat to the world. Sora then questions Reiji himself, asking the nature of Pendulum Summon and where he came from. Reiji refuses to answer any further, telling Sora to get his remaining answers from Yuya himself. Reiji then leaves Sora with three prototype Pendulum Monster cards and the name of what Yuya is searching for: Genesis Omega Dragon. Yuto being confronted by Sora. Leaking out the G.O.D card, Sora lured Yuya to the Physical Information Company where Solid Vision is being researched. As Sora expected, Yuya and Yuto, along with Yuzu, took the bait and sealed them all in so he can duel Yuya. After a brief banter, Yuya not answering his questions while admitting to the youth that he knows nothing each about the G.O.D card, Sora commences an Action Duel with Candy Park as their setting. Yuya has the advantage at first until he finds a photo of Sora with a younger girl, causing the boy to cry as he reveals her to his younger sister Miu Shiunin. Sora then spins off a lie that Reiji is holding Miu hostage and that he must beat Yuya to ensure her safety. This gives Sora the edge as Yuya becomes utterly conflicted, forcing Yuri to take over. Yuri proceeds to mercilessly attack the boy while convincing Yuya that Sora was playing him. Once Yuri tore up the photo to prove his point, smiling maliciously as Yuri triggered his trap so he can get an Action Card, Sora confesses that he lied while using his new Pendulum Monsters to turn the tables and reduce his opponent's life points to 100. Sora then adds that he also rigged the dueling system to inflict three times the normal amount of pain. Yuya manages to convince Yuri to switch back, telling Sora that he will not allow him to abuse Pendulum Summon to harm others. Yuya proceeds to defeat Sora in a way that destroys his "Frightfur Dare-Devil" while reducing his Life Points. When Sora realizes Yuya is using roundabout tactics to beat him without even suffering once, the boy becomes utterly enraged at what he considered an act of pity. Sora retaliates by using the two Action Cards he obtained to self-inflict 2000 points of damage, which would cause the dueling field to self-destruct at the possible cost of Sora's life. However, having watched the duel unfold, Eve sends Ren to quickly retrieve Sora so he would quickly receive medical treatment. Waking after a dream of visiting Miu and assuring his sister that he not forget her while making a new world for them to live in, his memories restored, Sora finds Isaac by his side and informed him of how he returned to their group. While Sora helped Ren in tracking down Yuya and Reiji after they fell off the grid, it is revealed that Sora has no memory of his life before aligning with Eve. Sora is next seen accompying Isaac after noticing someone is spying on Ren's duel with Yuya. Finding out its Reiji and that he's currently watching the duel from a satellite, Sora is impressed with Issac calling him a genius which surprises Sora as Issac considers himself a genius as well. Although he offered to duel Reiji, Isaac decided to take care of the matter himself. After Ren is defeated Sora is watching him recover from his duel. 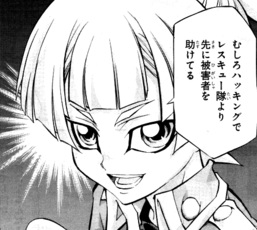 Sora is planning to duel Yuya once again and states that things will be different now that he has his memories back. This page was last edited on 21 December 2018, at 18:27.